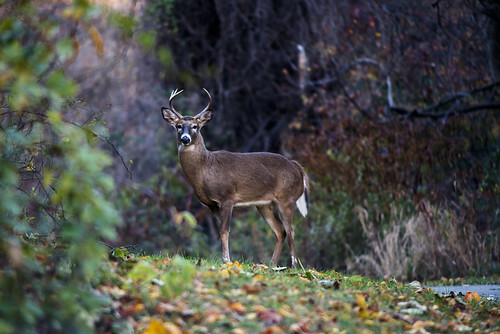 The Maryland Department of Natural Resources announced today that hunters harvested more deer during the early hunting season compared with last year. Maryland hunters wrapped up the early portion of the archery and muzzleloader seasons by harvesting an estimated 22,199 deer in September and October, an 11 percent increase from last year’s official harvest of 19,923. The two-month harvest included 12,583 deer taken during the archery season (including 6,585 taken with vertical bows and 5,998 taken with crossbows) and 9,362 harvested during the October muzzleloader season. An additional 254 deer were reported during managed hunts. Hunters harvested 571 antlered and 563 antlerless sika deer as part of the total. The archery harvest increased 2 percent while the muzzleloader harvest increased 30 percent, most likely due to more favorable weather conditions and increased effort when compared to last year. Overall, the antlered harvest increased 23 percent from 6,374 to 7,821 deer and the antlerless harvest increased 6 percent from 13,549 to 14,378. Turkey hunters reported taking 105 wild birds during the one week fall season that ended Nov. 4. The harvest was slightly lower than last year. Harvest numbers for each of three participating counties were: Allegany, 24; Garrett, 55; and Washington, 26.